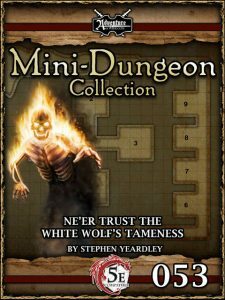 This mini-dungeon can be run as a sequel to “Look not with Thine Eyes, but Thine Mind“, but works just as well on its own. The PCs continue their descent into the bowels of the earth, teleporting into a lethal trap, where multiple, deadly guardians must be bested to escape the “Wolf’s Eyes” – a kind of guarded teleport trap. “Everything is ceramic”, the module states – which is cool. I’m less enamored with “relevant check DC 10” – looks like a conversion relic to me. Free of this challenging gauntlet of rooms and its powerful golems and swarms, the PCs have to make their way through the lethal traps of “the wolf’s jaw” – and from here on out, things only get more foreboding, as remnants of horrific fates, 4 random encounters you may or may not use, and a terribly injured group of adventurers speak of worse things awaiting in “the wolf’s mind” – a part of the complex where the way leads further below. The 5E-version also comes with a rather cool creature, the Iron Lector – neat! Stephen Yeardley sports a nice quasi-puzzle, some challenging traps and foes and a thematically concise and interesting mini-dungeon here. No complaints, well worth getting – 5 stars, and the 5E-bonus critter makes for a cool added bonus. Once again, I cannot comment on who has done the conversion here.